Need advice about a specific Ford Fiesta problem? Chart based on 500 repairs. 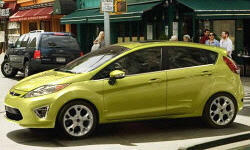 See TSBs and recalls for the 2011 Ford Fiesta. Chart based on 213 repair trips. The repair cost chart excludes repairs made under warranty, do-it-yourself repairs, and repair trips that include maintenance. See repairs for all Ford Fiesta model years. 2000 mi Car does not run smoothly, maybe an electrical problem. 17000 mi Two noises. One reminiscent of an ungreased speedometer cable. The other reminiscent of a transmission low on fluid. They said they couldn't hear the noises and found nothing wrong. 11780 mi Steering was tight and was tend to drag one right side. 11421 mi Re-Torqued Rear shocks and bolts. Funny sound while driving, did not affect driving performance. C $350 Vents would freeze and lock up after 2 hours. Snow/ ice would blow into the cabin. 5000 mi Owner noticed problem with starting/transmission; reported to dealer; dealer noted service bulletin on issue; car to dealer, dealer fixed; no charge to owner. 25420 mi Common fuse issue replacement and new wire used for fuse behind rear passenger seat. There is a TSB out for this issue. US $265 Transmission would flip flop between 1st and 2nd in stop and go traffic. ECM and TCM were reprogrammed and problem was solved. US $43 Lower Oxygen Sensor began to fail. US $1296 Electric power assist motor quit requiring replacement and reflash of main computer. 272300 mi Audio system failed, made screeching noise, replaced. US $115 Replaced noisy fuel pump. US $600 Removed powershift transmission and replaced dual clutch pack. It took a month to get the part from Ford. 354800 mi Front end vibration between 55 and 75 mph, only when accelerating. Replaced left half shaft/CV joint. Rides beautifully once again. US $85 Felt like the engine was missing slightly but only with cruise control. Throttle became non-responsive only once for about a minute at highway speed. Replaced throttle body motor. 408000 mi After almost 3 years of driving 9-12 hour nights / 6 days a week, with the headlights on all night, my alternator finally gave up the ghost. US $60 Discover pinhole leak in coolant recovery tank. Engine still ran normal temperature. No warning of a problem. Closer look revealed spider cracks. Replaced tank and topped off coolant. 455200 mi New catalytic converter and both O2 sensors due to repeated emissions codes for the past three months, light was annoying. Sensors 37.99 ea off RockAuto, used cat $100 off ebay. Front struts and rear shocks. Shocks seem to do the job up until 150k depending on the road. Unfortunately they start to show oil leakage at about 50k. Struts are about the same. They seem to start knocking on rough roads at around 150k. Found first oil leak at front main seal. 1 very small drop of oil. US $85 Excessive vibrations coming from radiator cooling fan. Easy fix, just don't wait until it comes apart and ruins your radiator, then it gets expensive! US $600 Clutch lost friction, replaced entire transmission with a used one because it was cheaper and easier to get at the time than just a clutch. The last clutch I ordered took a month to get from Ford. 567000 mi Starter quit. No warning, just quit. Half a million miles on the original so I'm not complaining. I am however complaining about Ford parts. Not one dealership in this state deems it necessary to keep a starter for a three-year-old car in stock. US $200 The last throw out bearing I put in has had a steady whine to it but after 60,000 miles it hasn't changed pitch so we'll wait and see. US $35 Heater blower motor quit. 650000 mi Replaced the front wheel bearings. US $30 Factory horn quit after heavy rain. Replaced with a four-note horn from a 1971 Cadillac. Right side headlight bulb quit after heavy rain. US $311 Lost power to fuel pump. Body control module failed. Part not in stock and was shipped overnight. 705000 mi Replaced the a/c compressor for the FIRST TIME because it was getting a little noisy. Audio system failed again. US $900 Clutch began slipping when hot. Pulled transmission and replaced DCT's clutch unit. US $225 Worn front struts. Replaced both struts and mounts. US $42 Camshaft position sensor was throwing a code. Noticed fuel mileage wasn't as good as it had been. US $10 Weather stripping came loose on RR door. New weather gasket installed. Weather stripping came loose on LR door, Parts ordered. 13000 mi Dealer replaced LR door weather stripping, came loose next day. Restuck weather stripping- still holding. 17000 mi Both rear shocks leaking, replaced again. This is the third set of rear shocks this car has had. 24000 mi Rear shock absorbers leaking again. One day over warranty dealer will not fix, says Fiesta not made for dirt roads. Transmission still acts up Car does not steer right (wanders). Dealer says "can't find anything wrong." 11240 mi Drivers side mirror has a minor jitter or vibration from the glass itself. Noticeable over rough or uneven road surfaces. 14980 mi Drivers side mirror has a minor jitter or vibration from the glass itself. Noticeable over rough or uneven road surfaces. 63240 mi Malfunction indicator Lamp on(Service Engine Light). Vehicle did not behave different, but noticed increase in fuel consumption. Lamp went out with gas purchase next day. Dealer performed recall for fuse panel by replacing a fuse and cleaning fuse box of salt corrosion. C $490 Worn out front brakes Brakes rotors worn and pads very thin.All below spec. 3000 mi Love car but powershift trans. sometimes makes noise when shifting and shifts roughly at low speeds. Second reflash per TSB. Low speeds rough shift largely gone but some grind or chatter noise at shifts still evident, mostly when air is on. 23000 mi Inside rubber door seal was peeling from rear driver door near window. Repaired under warranty by dealer. Seal failed again at same spot within a week and dealer glued it down on return trip. That seems to have done the trick. 10800 mi Rear door weatherstripping needed new adhesive application. Covered under TSB. US $64 Grinding of gears when I accelerated. Car hesitates. clicks in and out of gears when I am at the lower speeds. US $45 Routine car maintenance but mechanic discovered that oil drain plug was stripped. Only ford dealers have worked on this car so it was done by a ford mechanic. 70000 mi Transmission was loud, jerky, stumbling. 78000 mi 3rd time for the crappy transmission. Ended up fighting with the dealer and traded out for a 2013 Hyundai Sonata with 35,000 miles! 40000 mi Replace module & reprogram. 40200 mi Same trouble with the clutch pack and program. 40300 mi Replaced the clutch pack. 44000 mi Clutch chatter....dealer said the trans was working as designed!!!!! 49000 mi Replace clutch and re-program, as usual. Should be good for another 6 months. About how long the clutch lasts. 25000 mi The clutch pack was leaking so I had it replaced - it was covered under warranty. Was told that this was a common problem with the Fiesta. 4000 mi The dealer stated the new radiator did not come with a cap on a tube so they used my old one. It blew off, car overheated again. Both rear pass door moldings were falling off. The seat was burnt while they had it. 4000 mi Car often failed to start or the throttle would not respond. The car was never fixed we had to sue Ford for the Lemon Law and won! This car is terrible and we hope no one buys this car! 2000 mi Was making a clacking noise at certain speeds. New car was pulled off lot to compare. Dealer said all of the Fiesta's do that. No repairs made. 2000 mi Much lower mileage than advertised (25 mpg with careful driving, mix, mostly city). Was told mileage would improve by around 2000 miles. Now more than 2000 has improved, 26-28 in heavy city traffic, 35 mpg overall mix of city and hwy. 10900 mi Reflashed transmission, noises remain. 11300 mi The automatic trans. had new grinding and clattering noises. Dealer thought needed repair, but Ford central said (without hearing noises) that "those noises are normal. "Weren't there first 10,000, so at my insistence, they authorized repair. 15000 mi Finally, after much insistence on my part to Ford-- with backup from the dealer that abnormal noises could be heard, the automatic clutch module (of the auto transmission) was replaced and the transmission functioned well without noise. 5000 mi Car would not move forward while transmission in Drive. Car was able to move in reverse. 13000 mi Flywheel failed. I was sitting in bumper-to-bumper traffic when the engine light and the "limp home" light came on. The Fiesta did make it the additional 50 miles to the dealer. Still hesitates, bursts, tach jumps around, stutters, etc. After the flywheel repair, the car made grinding noises in reverse. It also would shift through all four gears before I got to 30 mph. Returned to the dealer and left the vehicle for several additional days. They said it was a computer prob. 21700 mi Car hesitates and lacks power. Rear window seal falling off. Vibration/rubbing noise near front vent window. 30900 mi Vibration/rubbing noise near front vent window. 40000 mi Vibration never fixed. Twice they stuffed some double-sided tape into the crack and told me there was nothing else they could do. I ended up folding a piece of paper over several times and stuffing it in. Worked but looked ridiculous. US $200 AC Compressor replaced. Noticed noise coming from the vehicle. Seemed louder on acceleration and up hills. Tech also heard noise and believed it to be coming from AC Compressor. 22700 mi they replaced bad sensor and re-programed the computer...problem solved. US $300 AC Recharged due to low refrigerant level. 16200 mi Clock was losing time. It needed a software update. Clock was losing time. Needed software update. 22000 mi Code PU29F -- vacuum leak detection module failed. New part installed under warranty. 1000 mi Full transmission replacement after experiencing rough acceleration, rough shifting, grumbling noises, diminished power to engine. US $780 Slave cylinder failed. Replaced clutch because it was very inexpensive to buy and both could be replaced at the same time. 2000 mi Gas gauge does not go to full. Unable to fix now. 11000 mi Gas gauge didn't go to full since car was delivered. Took until January for the dealership to get the OK to fix. Replaced engine block heater. TSB. Some Fiesta's have had failures, so Ford is replacing all of them. If a failure occurs, causes loss of coolant. 46700 mi Oil leak Part of the steering shaft was repalced. Made noise when turned. Service engine now light. Still not fixed. I think it was caused by replacing steering shaft or transmision removal. Been in several times, replaced parts twice. Still not fixed. 56800 mi Check engine light went on, went off a few days later. Hasn't been on since. US $100 Front end was rattling. New inner tie rod end and new front struts. Covered under extended warranty with $100 deductible. 77000 mi Hood prop holder broke. Replaced strut bearing. Took over two months to get the part. US $500 Leaks in both output shafts where they leave the transaxle. 18000 mi Left speaker started distorting strongly; speaker was replaced free of charge. 35000 mi Door insulation on both front doors became detached in places; was replaced. 37000 mi Transmission fluid leak. Engine would shut off while driving due to system computer software glitch. Update: software update failed, replaced PCM. 39000 mi Car would shut off while driving due to software problem. Initially unsuccessful. Turns out that the new PCM wasn't properly installed. 62900 mi Turning the key in the ignition produced no effect (car wouldn't turn on, engine wouldn't turn over). US $35 Slight wind noise from rear driver side door. Door seal was replaced under warranty. US $3 Car would not start. Used instructions from a known TSB for grounding issues to repair. Charged battery. US $25 flat tire: Air pressure valve leak repaired. 18300 mi Rear door window seals again flapping. New TSB. Warranty repair; no cost. 39000 mi Ford replaced defective door lock modules under a recall program. Rear passenger door lock failed and door wouldn't close. 8800 mi I called ahead with the TSB number and what needed to be done. They did not order the parts required, but took care of the other warranty work I needed taken care of. So I had to make a return trip for the rear washer fluid leak fix. The digital clock was losing about 30 sec a week. Reflash the new software and it is fixed. There was an update to the stock software that improved transmission performance and feel. 37400 mi Door latch recall fix was performed. We were not able to open the door sometimes in very cold weather. No audio from front passenger speaker after previous dealer repair. Dealer reattached a speaker wire. US $30 Replaced blower motor resistor. 60139 mi Transmission halted/stuttered going between neutral and first gear and between first and second gear. Ford dealer performed transmission computer update and replaced clutch assembly and clutch slave. Fix was performed at no cost due to it being some sort of manufacturing problem. 70000 mi Transmission control module was fried as a result of the battery dying. This is a known issue to Ford, and the transmission control module is covered under an extended warranty. So the dealer replaced the module for free. 49000 mi Would occasionally get engine malfunction light. Dealer found TSB for this issue. 64000 mi Replace worn bushing in steering system that was causing jerking at low speeds. US $1000 Loud grinding noise from transmission. Dealer state broken washer allowing gears to rub together, replaced output shaft assembly. An accident might have caused this, as car was hit at rf wheel nine months earlier. 94000 mi Replaced clutch pack under warranty. I believe it was related to earlier transmission repair as symptoms (vibration at idle) occurred immediately after repair. US $80 Replaced fuel filler door. Door had broken hinge. US $2250 Rear right window would not roll up reliably, window track/guide replaced. $250. Replaced clutch pack. Replaced under warranty in May 2016, but started exhibiting shuddering and slipping within a year. Unfortunately, Ford extended warranty would not pay for a second time since car passed 100,000 miles. We will see if this repair holds up throughout the year. $2000. Edit: Noticed car had vibration, dealer said it may need to break in. I waited a few months and problem seemed to get worse (or I became more sensitive and annoyed). Took back to dealer to fix. Info in April trip record. US $300 After replacing clutch pack in December, car had noticeable vibration even at idle, which wasn't there before. Original repair was for shuddering/slipping clutch, car drove fine otherwise. Dealer replaced motor mount at my cost, and replaced clutch pack again under repair warranty. My opinion is some mechanics are not following procedure for these repairs. Hard to believe the clutch was causing vibration, it shifted fine. In any case, after second attempt to repair it's working excellent again. 50700 mi Car fell into neutral. Couldn't shift. Then stuck in park until it cooled. Three separate trips to dealer. Nearly 30 days in the shop. All covered by warranty. I was provided a rental. US $38 The previous oil change, whoever put in the drain plug (it was Speedee Oil Change in Redwood City) stripped it and put some sort of caulking to seal a leak. This different shop needed an air wrench to remove it, and then put in a new plug. The plug was $38... for $5 part, but that's OK - I couldn't remove the damned thing. 55800 mi Eratic shifting. No reverse. Replaced computer modual and clutch assembly. Had to return to have clutch realigned. Was supplied with a u drive at no charge. Warranty extended. 5000 mi Buzzing/grinding noise when accelerating Passenger side rear window would not roll all the way up. 5000 mi Buzzing/grinding noise when accelerating. It is still under investigation by Ford. I was able to get the dealer to buy it back. 95000 mi Replaced the coolant fan motor. Replaced the throttle body. These two repairs would have been $600 without the 5/100 powertrain warranty. 1000 mi This is a known issue with Ford's new 6-speed "manually" shifted automatic transmission. The shifting was horrendous and unsafe to drive. The car would lurch and shift erratically. The flash update to the software has mostly addressed it. 4300 mi The automated-manual transmission continues to behave erratically. Ford, again, said it works as designed. They did nothing to help me. 5500 mi 2" of seal around left rear door came loose. Dealer replaced entire upper door seal under warranty. 2" of seal around left rear door came loose. Dealer replaced entire upper door seal under warranty. 8300 mi Left passenger window went up very slowly. Dealer replaced the trim at the bottom of the window which was binding. 13000 mi Had several instances of Check Engine light coming on. Took into dealer and it was a "throttle body error" Replaced several electrical connectors and a tube under a Technical Service Bulletin so there was no charge. 16000 mi At slow speeds car has STARTED to act like it doesn't know what gear it should be in (6 speed Auto). Dealer reset transmission computer, when this did not solve problem replacement clutches ordered. 17000 mi Jerky acceleration at slow speeds. Replaced dual clutch in 6sp auto and reset transmission computer. Covered under Ford's extension to warranty. Behaves correctly after work. US $165 Double clutch 6 speed automatic. Started shuddering again at slow speed, worse when AC on. Got call back that they are replacing clutch (2nd time for this car) under warranty. 1 year left on the extended transmission warranty. Parts ordered. Trim at bottom of rear passenger side widow is coming loose at the front. Causing vinyl strip on door to bunch up at bottom. Replaced the trim piece. Did nothing about the bunching vinyl. US $439 when brakes 1st applied there was a scraping noise. Recommended specialist examine the breaks and dealer replaced pads and break fluid. After about 4 months the new pads finally settled in. 15000 mi Repeat attempt to fix the grinding/jerking whilst changing gear. Mechanic claims that's normal for this model. Nothing replaced. Whilst trying to fix gear changing problem, mechanic broke the passenger side power window switch. Then installed it backwards. Took it back the next day for him to do it properly. Passenger side speaker crackled when in use. Fixed on second attempt after dealer "could not hear the problem". 36000 mi Switch that opens the passenger side window stopped working. 46200 mi Battery was dead after the car was parked for two weeks as we were out of town. Tested the battery and it had to be replaced. 25000 mi Would only rev after second gear and wouldn't go into reverse, had towed to dealership, replaced transmission control module (TCM), solved problem - car also shifts much smoother now. Fixed under warranty. 33300 mi Took car to dealership for check engine light, found the NVLD (natural vacuum leak detection) sensor faulty and replaced per TSB. Problem fixed under warranty. 58800 mi Car wouldn't accelerate after taking an off ramp. After putting car in park and turning off it wouldn't restart or let the gear-shifter out of park. Dealer diagnosed it as a faulty shift module and replaced it free of charge. 35300 mi Car would not start. US $65 Push button start timed out cranking engine. Engine sounded horrible while cranking. Dealer found nothing wrong. US $500 Rear shocks replaced, probably been leaking for 5,000 miles. Front struts replaced, upper plate broken on right front. US $200 Ignition switch was eating keys and near failure. Replaced. 45000 mi Left rear shock was leaking oil, dealer replaced under warranty. 45000 mi I thought I heard a small rattling noise from the engine/trans when driving around real slow at 1,500 rpm. Dealer did an inspection, found nothing. 46000 mi Water pump was wobbling a little, they said the water pump shaft was not straight. Water pump pulley was out of round, replaced with new one. US $439 Was making a slight clunking noise when turning slowly. Dealer said might be electrical, turned out to be the intermediate steering shaft, which there is a tsb for. 40000 mi Car still not accelerating and stopping properly. Cannot drive vehicle on highway safely. Dealer (DaveSinclairLincoln south Lindbergh st Louis mo) says here is nothing wrong with the vehicle. 27000 mi Leakage of engine oil into transmission. Clutches had to be replaced but there were no parts available. Got the clutches replaced but the car just isn't the same. 27500 mi The transmission was doing a strange sound. Dealer stated they needed 5 days to repair it. 30000 mi The car jerked when shifting gears. The gears it shifted to wheren't always the correct ones. Car's performance suffered because of this. 2177 mi full wiring harness and 3 computer modules replaced as well as pass side air bag. at 3500 km Check engine light and oil change needed indicated on info center, traction control light on intermittently as well as hill assist light on indicating that hill assist not available all at 3511 km. Jan 2015 Transmission shudder and rear main seal seeping oil. Ford Field Service Action No. 14M01 is a warranty extension for this exact issue. Local dealer replaced the clutch, seals and fluid. $1989 parts and labor, all covered by warranty. 103000 mi Diagnosis of transmission slipping, as evidence by the shuttering and grinding that occurs at take offs after the car has been warmed up. It was happening basically the entire 3 years I owned the car, but got steadily worse over time. I hear it's a common problem with these cars, and I had decided to live with it until it got this bad. I did not get it repaired. I'm trading it in. 9300 mi Steering column made noise when turning back and forth and over any bumps in the road. Column was replaced. 38000 mi Transmission rebuilt (clutches and associated wearable parts). Transmission connections (spline/bearings) to front-wheel drive system replaced. Front, driver CV joint replaced. 38000 mi Transmission completely replaced. 4340 mi Sync Radio - The radio voice activation and USB port keep freezing up. The only way to clear is to reset. Dealer was to upgrade but claimed it would/could take hours and since a new version is to come out soon(???? )I decided to wait. C $475 Check Engine light was on. Service determined it was an O2 sensor. Parts were ordered and replaced. Transmission was replaced in June under extended warranty. Driver side noise started immediately thereafter. 5000 mi Starter made "klunk" sound when starting, engine ground needed to be cleaned and lubed for better contact after paint was ground off attachment point. Repaired as per TSB 10-19-6. 8000 mi Check engine light came on and stayed on. Smoke test revealed leak in EVAP system. Easy-fill capless system taken apart, cleaned, and reassembled. Code removed. 28000 mi Car would not start and towed to local Ford dealer. car started for them the next morning. they ran tests and found nothing wrong. re-cleaned grounds per TSB( had been done once already)and found one ground they missed the first time. US $80 front brake pads beginning to stick on slides; cleaned and lubed. US $11 Car was starting harder than normal. Battery terminals need to be cleaned and lubed. US $200 Blower fan speed had failed from 4 speeds to 2 speeds. Ballast resistor replaced, 4 fan speeds returned. 7000 mi check engine light came on and then went off. took to dealer to make sure no problems existed. 9000 mi dealership indicated the code they saw when diagnosed would not fix according to the procedure set in place; they called the Ford hotline and were told to "overlay the wiring harness." 14000 mi service engine light was displayed on dash. took to dealer was advised needed to order part. tsb 11-8-6 repair performed. 18200 mi Loud grinding from axle. Traced to improperly installed carrier bearing. Cylinder misfire observed during test drive after update. Replaced coil pack, but misfire returned. Reprogrammed module. 22200 mi Loss of hill-start assist intermittently while driving was indicated on control cluster. Accompanied with a click noise from relays/fusebox in glove compartment. 6000 mi Speedomer reads 2.5mph fast at 50mph and 4.5 to 5mph fast at actual speed of 70mph. Ford states that the varience meets Ford standards and can not be calibrated. 6700 mi starter motor replaced to stop oil leak at bottom of bell housing. Very small amount of oil dripping from bell housing. Dealer states lubricant from starter motor is the cause and has ordered new starter motor. US $404 Had to replace catalytic converter. 138200 mi Transmission failure. Covered by a warranty extension from ford. 2480 mi gas tank sensor had to be replaced. service bulletin was issued but no one from the car dealership notified me. I read about it on this site. Now the gauge goes to the top and the readout on the dash includes another 150 litres. the covers for the 12 volt plug-ins on the console did not stay closed. Both front and back. The total plug-ins were replaced not just the lids. The console was damaged by the repair person. Outcome pending. 3100 mi the rear shelf panel on the right side of the cargo area was split. the piece along with the trim was replaced the sync was not working with my cell phone .. a software update corrected this problem first gear had been jerky for the beginning . I complained many times but nothing was done. I threatened legal action and after a couple of test drives and an adjustment to the transmission software it is running perfectly. 4960 mi brakes making terrible squealing noise I took my Fiesta back to the dealer and they found that the brakes had never been lubed... they are now and the noise has stopped. 5580 mi when I put my Fiesta in 'downhill assist' it went into neutral, engine roared and then leaped forward. The motor was racing but it was like being in neutral with your foot on the gas. The software was updated. The gas gauge was also reset. the icon for 'low tire pressure' was on but all 4 tires were within the required range. Each individual tire had to be reset with some computerized equipment and the the icon went off. Big nuisance! US $100 Car was idling bad would die at stop. Throttle Body was sticking, replaced Throttle body. Clicking noise was heard when changing direction (rotation) of wheel. Steering Column replaced. Steering was making clicking sound, replaced steering column Throttle body found to be sticking, replaced. US $100 Air Conditioning stopped working when idle. Found secondary radiator fan was not working, replaced radiator fan. No engine overheat light never appeared. 2800 mi Rattle in interior drivers door handle at highway speeds, goes away if you grip handle. Dealer verified noises and removed door trim panel and applied felt tape to area behind handle and switches. Road tested and noises are gone. 6000 mi Vehicle will not go into Drive or Low. Cleaned grounds, reprogrammed PCM and TCM to latest calibration level per TSB 10-19-6, performed adaptive shift strategies and charged battery. 2000 mi Driver's side LED parking lamp loose on bottom end. Simple reattachment needed. 10000 mi Car exhibited "hard" start & "klunk" noise prior to starting since the weather got cold. Was made aware of a TSB re: this issue and had appt. on 12/8/10 for repair. Car ended up being towed because it wouldn't go into "D."
17000 mi My fuel tank never registered completely Full after a fill up. The fuel tank needed a new sensor. There is a TSB on this issue. The digital clock was losing 2-5 minutes per week. There is a TSB notice on this issue. US $360 Driver's side axle seal needed to be repaired. 31300 mi The fibrous heat shield on the bottom of the hood shrunk and fell loose in the rear. It was lying on the motor but still attached in the front. I bought the part and easily replaced it myself. 7000 mi Initially, car cranked / would not start. Once started, auto transmission would not engage reverse. Entered reverse after repeated attempts, once underway it did not shift properly, could not drive over 30mph. Towed. Dealer applied TSB. 13300 mi Brief intermittent Check Engine Light observed a few days before routine service. Dealer service mechanic identified self-test fault P013A, replaced Heated Exhaust Gas O2 (HEGO) sensor. No other symptoms. No cost. 25000 mi No water had leaked, but the weatherstripping on the rear passenger door was coming loose. 31000 mi Not shifting properly. Jerky acceleration. Would not engage reverse. Service light illuminated. Dealer attempted reprogram of transmission control module. Control module required replacement. 38400 mi Alternator not providing sufficient power to recharge battery, replace. Charging system indicator light on, non-essential accessory systems not functioning. Software for charging system needed to be updated following earlier alternator replacement. US $100 Fuel vapor leak detection system sensor failed. Impacts ability to pass emissions inspection. Dealer has replacement part on backorder, managed to get existing sensor to work briefly to pass inspection, still waiting for part to be available. US $250 Part finally came in for fuel vapor leak detection system. Installed quickly, no problem since. 4000 mi Thumping noise in rear of vehicle while driving over uneven pavement at low speed. Engine RPM rhythmically goes up and down 200 RPM when under load between 40 and 50 mph on occasion. Not a serious problem and rare. Updated software per TSB that did not quite match the symptoms. Did not fix the problem. 10000 mi Check engine light came on - TSB: 10-24-10 Replaced NVLD module assembly Clock loses time - TSB 11-3-21; Updated software. The computer locked up during reflash. Took Ford and the dealer 2 days to get the computer to reboot. Everything works now. 34000 mi CEL came on and would not clear. They were not able to find the cause. Shop cleared it but it came back on within a few blocks. I cleared it myself with an UltraGauge the next day and it has not come back. 37000 mi The car has on 3 separate occasions, had difficulty fueling up. It will take anywhere from .1 to .3 gallons until fuel runs up the filler neck and shuts off the pump lever. It will repeat this for the entire fill up. Parts are on order. 42000 mi Transmission seals on input shaft to dual clutch failed. New seals along with new clutches were ordered from Ford. They are currently on back-order, and we are awaiting for them to arrive before car can be repaired. Car is still drivable. 46000 mi Ford sent out the back ordered 3rd generation clutch-pack needed to repair my leaking input/output shaft leak. 59000 mi Output shaft #1 and corresponding gearset were replaced. metallic noises from transmission were getting louder and metal was found in gear oil. With the earlier clutchpack replaced, about $4000 in repairs have been covered under warranty. 7000 mi Vibration around 2000 RPM. Did not replicate when taken for a test drive. Vibration has since decreased after 2 weeks. 9000 mi The car would not go forward, only would move in reverse. The transmission ground wire did not make a good ground. There is a TSB on this item, but the TSB is only after failure. 17000 mi Fuel gage never reads full. Clock looses 2 minutes a week. 18000 mi Fuel gage sending unit had to be replaced. Gage would never read full. Clock lost 1.5 minutes per week. 27000 mi Check engine light came on. Repair covered by TSB. 57000 mi Automatic Transmission would not engage to drive car forward after driver 30 high speed miles and stopping. Once placed in park it would not come out of park until engine was turned off and waited 15 minutes. Fix: reprogram transmission. 58000 mi After driving over 35 miles at highway speeds and stopping car would not go forward or reverse, it was as if car was in neutral. Once car was in park you could not take it out of park. Shut car off, wait ten minutes and then car would go. 12000 mi Tranmission leaked fluid, resulting in poor performance. The shop had to try 3 times to correct the leak. 3000 mi Tsb 10-19-6 a hard start, no start, intermittent start no automatic transmission engagement in Drive when shifting from Park to Drive. Clean ground. Reprogram the PCM to the latest calibration using IDS release 69.02 and higher. 1000 mi All of the fluid leaked out of the transmission without any kind of notice from check engine lite or vehicle health report. Car made loud noise going uphill and after parked in garage noticed a large puddle of fluids on floor. Replaced transmission. 1000 mi A cover came loose and was rubbing on the axle. 12000 mi Blower for heat/defrost no longer working. TSB out for poss. of motor shorting out from debris due to no covering. Awaiting shipment of replacement motor...car sits at dealer because no motor available??? Update: now saying mid-March. US $518 Repair finally made for design flaw on hood cowl causing water to drip onto blower motor for defrosters and heat. Factory warranty just ran out, extended warranty declined stating body part failure. Defrosters and heat work for now. US $129 Original battery dead and "frozen" according to the store clerk who replaced it at the auto parts store. US $850 replace upper strut mounts, dry and worn. Replaced original tires with on 19000 miles on them due to dry rot previous week. 56420 mi 2nd gear occasional chatter / shudder. Unresolved. 17000 mi Could no longer play audiobooks from iPod after updating to latest version of Sync. After seven unsuccessful attempts ended up switching to an iPhone, which works. Update: also works with a Nano. 4340 mi Fixed fuel guage. A number of attempts were made. Attempt to replace the fuel sender unit in August was disallowed by Ford. In early January, attempted a software update with no success and decided to replace the entire instrument cluster. 2000 mi After you start the car, the sync button must be pressed 2 or more time to get it to work. Automatic Transmission somtimes does not shift into gear for a long time after accelerator is pressed. VERY DANGEROUS! Sometimes it rapidly alternates trying two different gears but can't or won't pick one. 3300 mi Dealer change oil and filter 1500 miles ago. Oil filter came loose. 8000 mi Play in steering... Replaced Steering Shaft after waiting a week for part. 25000 mi Problem with transmission not shifting correctly. Had reported problem multiple times but, was told it was supposed to work that way. Received letter from Ford of extended warranty for known transmission problem. Then they fixed it. US $60 Both rear doors weather stripping was coming off. 6000 mi Issue with Push Button ignition, engine sounded like it did not want to crank over on first attempt. Contacts repaired and transmission reflashed. Sync system updated as well. US $75 Check engine light for evaporative emissions system. TSB. Dealer charged $75 for diagnosis and attempted to screw me by requiring that I pay to replace fuel lines before they'd replace module for free. After resetting light twice it has not returned. 155000 mi Door Latches Replaced as part of recall. One had failed. Mar 2011 Within first 200 miles the stability control and hill assist lights came on. Car feels like its going to stall when lights first come on, then stay on and rides ok. Took 2 visits to confirm defective YAW module to be replaced. 2000 mi The dealer replaced the module within 1 day and the problem has not recurred. 13000 mi Clock losing time, like a couple minutes a week, that got corrected when I went in for an oil change. I did report it, the tech had not heard of it but did find a service bulletin so its a known problem. The hill start & stability lights come on when car is in motion, on flat surface. Would stay on until car was restarted. This was same problem that was occurring when car was first purchased and received major repairs to correct. 39000 mi Audio Control module that includes hands free phone and satellite radio had to be replaced due to a defect that causes the system unstoppable popping noises in the speakers & interrupts audio. Aug 2010 The grounding wire was too short. When the car was started at the dealership a second time, the engine stumbled and the 'check engine' light appeared and remained solid. As it turns out, a longer grounding wire resolved the problem. Jan 2011 Fuel gauge is defective and could not be repaired after replacing the fuel sender unit and updating the car's software. A new instrument cluster has been ordered to attempt, yet again, a fix to the problem. The fuel gauge never showed the correct volume of fuel in the gas tank. After replacing the fuel sensor without success at an earlier date, the dealer replaced the entire instrument cluster. Finally and thankfully, this fixed the problem! 6180 mi car would not start, towed to dealership, in shop for 11 days, waiting for modem that runs the transmission to be replaced. 6200 mi Module that runs the transmission was remanufactured to create a sealed unit. Stops working due to road dust getting into the unit. 26000 mi Damage from water leak never fully repaired. US $10 Center cap for alloy wheel fell off and lost. I purhcased a new one and installed ($10) - not covered by Warr. 9000 mi Weatherstrip on passenger rear door began to fall off. Dealer ordered replacement and repair was completed the following week. Rattling noise coming from passenger side dash. Dealer said it was coming from the mounts of the coolant tank. Adjustments made and noise has mostly gone away. May need to be revisited. 16000 mi Weatherstrip on both rear doors began falling off again. Dealer ordered replacement parts and work was completed over the next 2 days. Foam padding above radiator began falling off. Directional pad on left side of steering wheel began to wear out. Replacement sensor ordered and replaced over the following 2 days. 29000 mi Not exactly sure, but heard the problem was a common one among the '11 Fiestas. 3000 mi Check engine light came on at 2,525 miles. Took to dealer who said the code for the alert was gross evaporation from unknown source. Thought perhaps some fuel evaporated in tank. No repairs, just cleared light. 12000 mi Fuse panel near driver's right foot not clipped properly, so panel would periodically detach from the center console. mechanic said a clip was missing, fixed easily. 30000 mi Sync module completely replaced because it wouldn't recognize bluetooth, USB after software update. Over 1-month wait to get a new Sync module due to backorder. Missed work because only a M-f/9-5 specialist could perform the repair. 59000 mi Fiesta was subject to a recall for bucking and hesitation in the transmission. Software was reprogrammed to see if that resolved the problem. Since then I've noticed a significant improvement. Rubber lining around the rear driver-side window began to pull away from its setting; dealer needed to replace the rubber lining. US $500 Key fob no longer unlocked car, needed to be reprogrammed. This was not covered by warranty. Aftermarket number pad that unlocks drivers door no longer worked;repair attempt failed and it continues to be broken.also a faulty sensor. 82000 mi Windshield wipers consistently failed when driving in the rain - wipers would stop mid-wipe and not restart for several minutes. Took multiple visits to diagnose - had to operate wipers in the dealer's car wash to replicate the problem. Finally diagnosed as a malfunction of the "body control module", which would intermittently stop sending power to the wipers when wet. Dealer replaced wiper motor first, misdiagnosing the problem. Total repairs (motor and junction box) was $1,100, but only the junction box ($650) was required to fix the problem. Key needed to be reprogrammed after full replacement of the body control module, as reported earlier. Only realized key wasn't locking/unlocking doors after driving off the lot. 2000 mi Both rear shocks leaked oil. A Ford engineer I talked to said that examination of the first set showed that paint on the shaft had damaged the seal of the shock. Door edge trim peeling off. Starter Bendix was over-lubricated: appeared to be an oil leak when grease melted & dripped from engine bellhousing. Disassembled, cleaned, reassembled. 12000 mi Both rear shock absorbers leaking oil. Shocks replaced for second time. 25000 mi Rear shocks were leaking. 29000 mi Clicking in the steering at slow speeds or stopped. Replaced a steering shaft per TSB. Jan 2011 Fiesta made loud clicking noises during start-up. After a week of this, it wouldn't allow me to put into "drive" or "reverse." Repaired, per TSB. Several other Fiestas at this dealership already repaired per TSB. 32860 mi Broken piece of trim in liftgate hinge. 43400 mi Replaced driver leather seat cover upper portion. 1000 mi Evaluated by dealer in Sept and again in Oct for harshness in Transmission, inconclusive. 1000 mi Transmission breakdown. Had to replace but Ford has no replacements -- took weeks to get new transmission. Brand new car! 1800 mi Erratic and dangerous gear shifts again. Sudden surge/stall due to transmission being in unsuitable gear. Unexpected gear change - hunting. Reflash didn't help. 40200 mi Warranty repair of leaking transmission end cap seal. Axle seals found to be damp from fluid, replaced at same time under warranty. C $175 Rear shocks were replaced, the one on the drivers side was shot. 19000 mi Replaced horn and fixed clock losing time by upgrading firmware. 5000 mi gas gauge not reading to full detent, new sensor installed whilst car got first oil change. 11160 mi Centered steering wheel. Tilted to the right from factory. Fixed under warranty. 26300 mi Tiny leak in water pump detected by dealer during annual service. Replaced under warranty. US $450 Engine control module sensor failed, causing Check Engine to come on. Car continued to operate normally but the module had to be replaced. The CE came on when a service station did a checkup on the car, it is possible they caused it. 42700 mi Dealer found a subtle water pump leak I had not noticed, and replaced the water pump without charge. No symptoms I had noticed (not even a noise). I'm not sure what warranty covered this. US $350 Ventilation blower would only work on the higher settings, not lower settings. The blower fan had to be replaced. US $500 Replaced both rear shocks. I didn't detect the problem, but the dealer reported they were "leaking" and needed to be replaced (and were 7 years old). US $150 Ventilation: after parking outside in very cold temperatures, the servo that changes between inside and outside air was damaged and developed a clicking sound, and had to be replaced to fix the sound. 33700 mi Radiator losing fluid. Small of antifreeze in car. Update: temporary issue, cleared up on its own. 620 mi One speaker did not sound good. Dealer replaced and now stereo is good. C $79 Replaced weather stripping around door. US $50 Strut was leaking. Strut was replaced by dealer. 46000 mi Manual Transmission Shifter was sticking. 22800 mi Throwout bearing was making chirping noise. Dealer inspected and determine slave cylinder was defective. Rubber window guides were binding on the window preventing it from going up smoothly. 24000 mi Transmission making a mild gear whine noise at certain loads and RPMs. Dealer inspected and concluded noise was normal to design and operation. (I only had it inspected due to previous transmission repair.) Drivers window goes up slow and binds, causing the auto-kickback to stop and open the window when attempting to use the auto-up feature. Dealer cleaned track and lubed window guides. 30000 mi Throwout bearing was squealing on cold start with clutch pressed in. 6900 mi I noticed an oil leak on my garage floor and took it in, apparently, there was a torn CV joint boot. US $1000 Broken shifter cable and damaged shift linkages. Dealership's ineptitude made trip as long as it was. US $400 Loud noise coming from engine bay, service rep told me to bring in ASAP cause it was timing belt & covered under warranty. Ended being alternator bearing & not covered & would cost $850 plus rental car. Did not get it done at Ford! US $3 Ford painted all grounds. Car was stalling, lights were glitchy & Service Engine lights would come on & off with different codes. Would have wasted my time going to Ford! 94500 mi I located & cleaned 4 grounds on car but dont think problem was corrected. Warmer weather has helped. My drivers window switch works properly again, and car only shut down once in July. Will look for additional grounds when I have time. 108000 mi Fiesta has misfire, changed spark plugs but no change. Faulty code P0420, pending codes P0054 & P0300. US $350 Had to replace blown shocks in rear again, replaced all shocks, struts & springs. US $50 Bad throttle body, replaced with used throttle body from junk yard & corrected all issues. I also changed MAP sensor (new) with no affect on car. I had P0068 & P0300 code. US $20 Drivers high beam stopped working & new bulb didnt work, checked fuses & entire fuse box was corroded & full of dust. Vacuumed & chipped at fuse box & tried to remove fuses, almost all fuses broke when removing. Problem w/fuse box design. US $20 Headlight out again, new bulb & of course it was fuses again. Fuse box was dusty but not corroded, fuse came out & new went in after vacuuming & dialectric grease. I have to redesign fuse box! US $60 Inner tie rod was clunking, after 2 weeks of searching we found one. When I went to install I noticed the lock nut was lose, not properly torqued when KOST Tire did alignment. Repair corrected without changing part. keeping part! US $100 Bad O2 sensor & trying to find the right one was a challenge. Was getting bad mileage before service engine light came on. 35 MPG. Will change this weekend. US $150 Rear engine mount (torque arm) broke & damage exhaust header with cat. converter, replaced full exhaust (used) from engine to tail pipe & made new motor mount. Wiring & fuse box on car wouldn't allow vehicle to run, replaced entire fuse box & wire harness from newer vehicle at junk yard. Car is running great just need to adjust some plugs for ABS & drivers door, Ford changed wire layout between years. US $300 Head gasket blew, installed a newer motor from junk yard with 47k on it, 3 days later same thing happened. 15000 mi Clock was losing 5-10 minutes per week. Technician found TSB related to it and reprogrammed computer. 15000 mi Manual trans. became hard to shift from 3rd to 4th gear, like it was blocked. Dealer opened trans, found a synchronizer on brass sleeve missing. Replaced 3-4 shift fork, 3-4 synchronizer assembly and 17 different related parts. Again wouldn't shift from 3rd to 4th like last service call. Shop said 3-4 adjuster not snapped in place completely. Snapped in place to fix. 15000 mi Weatherstripping along leading edge of rear windows on both sides of car tearing and coming loose. TSB 11-2-17 addressed problem, weatherstripping replaced. US $350 Rear hatch seal developed leak. Carpet on right rear foot well was over an inch deep after a moderate rainstorm. Interior carpet removed and dried seal replaced. Ford customer service paid all but extended warranty deductable. US $40 Front end clunking on low speed turning. Diagnose needs new struts. 19800 mi Passenger door gasket failed. New gaskets installed. 4340 mi Drivers seat would not remain in elevated position. Seat would slowly drop while driving. 6200 mi Bluetooth not working. Sync would not activate. 14860 mi some issue with the oxygen sensor or something? According to the Tech, it was a known issue and replaced without question. US $100 A sound speaker was replaced. The $100 represents my deductible from my extended warranty. I was told the repair would have been about $300. 4000 mi Vehicle wouldnt start at times or wouldnt move when put in drive. Grounds cleaned according to TSB, reprogrammed PCM & clutch adaptive learning routines. Wipers work, then didnt turn off, parked in wrong positions. Switch, motor and wiring repaired, reinstalled. See our lemon odds and nada odds page to see vehicles with no repairs or vehicles with more than three repairs. To see how frequently 2011 Ford Fiesta problems occur, check out our car reliability stats.